Alexander Ritzmann works on democracy promotion and the prevention of violent extremism. 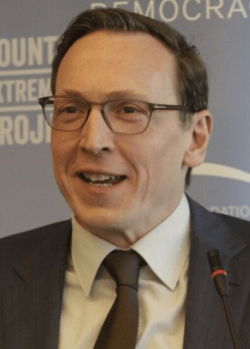 He is a member of the Steering Committee of the European Commission’s Radicalisation Awareness Network (RAN) and Co-Chair of its´s Communication and Narratives (C&N) Working Group. Alexander is also a Senior Research Fellow at the Brandenburg Institute for Society and Security (BIGS) in Potsdam (Germany) and an Advisor to the Counter Extremism Project (CEP) in New York (United States). From 2007 to 2017, Alexander worked with the European Foundation for Democracy in Brussels (Belgium). From September 2012 – December 2015, he was based in Cairo (Egypt), where he worked as Senior Advisor MENA Region and Project Manager for GIZ, the German Development Cooperation. Alexander Ritzmann has lived and worked in Berlin, Brussels, Beirut, Jerusalem, Ramallah and Washington D.C.
From 2001 – 2006 Alexander was a member of the Berlin State Parliament, overseeing the state police and intelligence agency, focusing on homeland security and data protection issues. He received his Master’s degree in Political Science from the Free University Berlin in 2000.